What happens, when you take two colors/suits of classic card deck and you crossbreed it? In most cases, the outcome won’t be anything interesting. But in one of the thousands creations, something unique happens. A race full of ideas. And that’s what happened this time, when Decktet was conceived. Today, in 2012, it’s been four years since this idea was born in head of P. D. Magnus. During that time, this card game has gone through several stages of development and stopped now in the existing professional version from Game Crafter, LLC. When you buy Decktet, you get one package containing only 36 cards. And that’s it, you ask? That is the great Decktet? Yes, and the greater is surprise, that it is really enough to keep you busy for many many hours. Decktet today is not a game, as the author himself admits, but either name for the package itself, just as a tarot or joker deck. 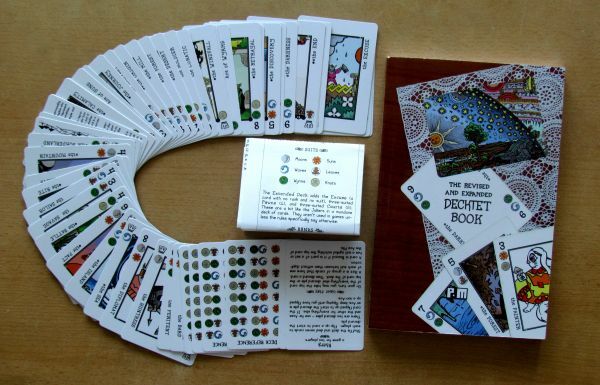 There are now dozens of decktet games and this deck is hugely popular. 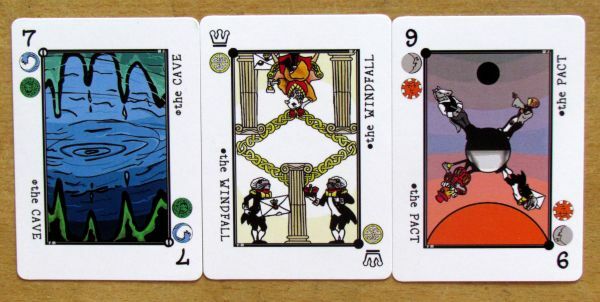 And what is the actual difference from the classical deck of cards, you ask? 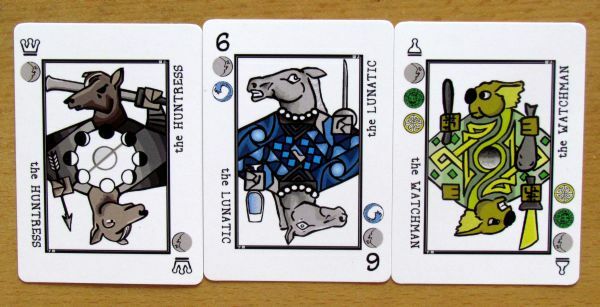 First of all, each card has a name and a very nice illustration (at least in our enhanced edition). But the most important thing is precisely that crossing, which we discussed at the beginning of review. Most cards have not only one, but several suits! But the whole deck is nicely balanced, because each color is written exactly on ten cards. 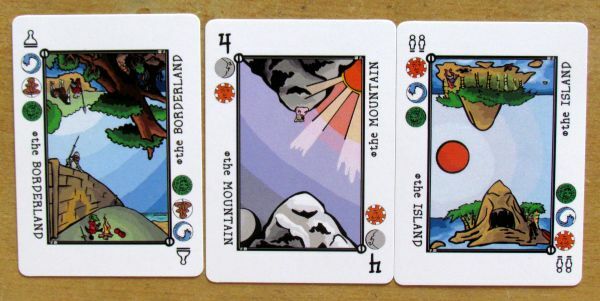 Besides these, you will also find advanced action cards in deck, which do not have any color – such as The Excuse. 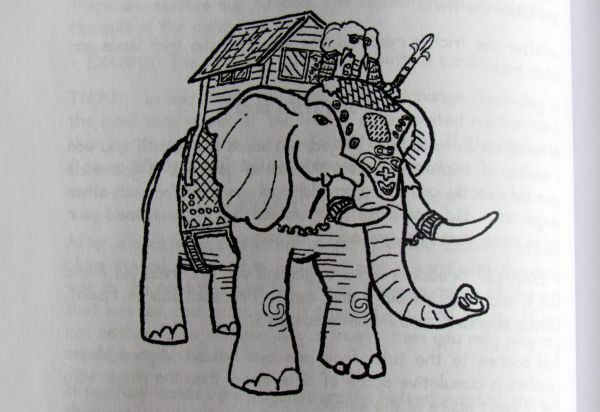 In 2010 P. D. Magnus, the author of the deck, gathered his strength and Publisher the first Decktet book ever. 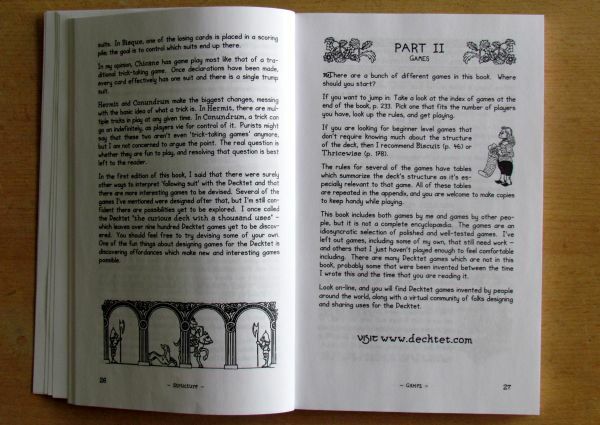 In October 2011, there came a time for a new, revised, refined and expanded book, containing not only the history of Decktet, but also a number of tested and recommended games. 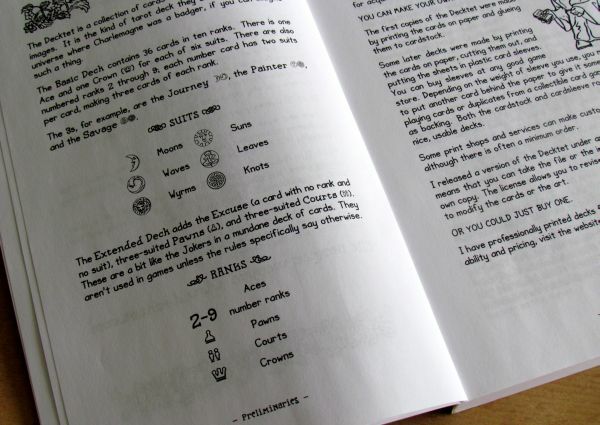 The book contains many interesting games and with everyone of them, you will also find icon indicating number of players, gametime and whether you need any additional materials to play. 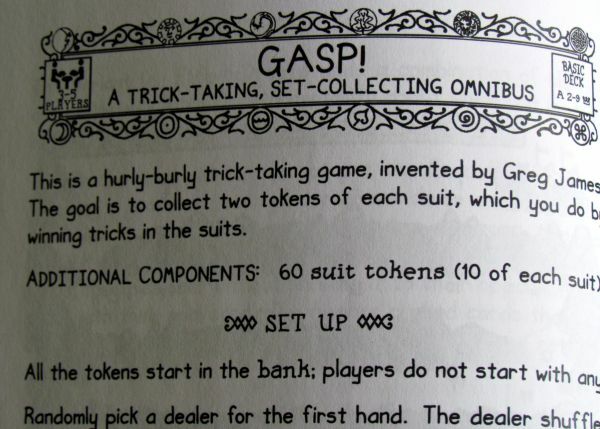 Sometimes it is good to have some tokens or dice, that you can use in games. 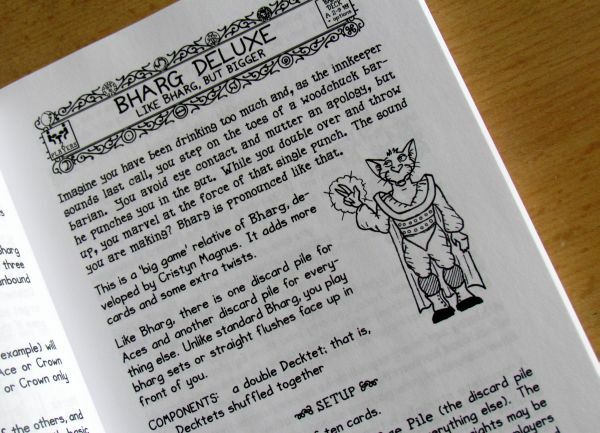 When you flip through the book, whole new world of card games opens in front of you. 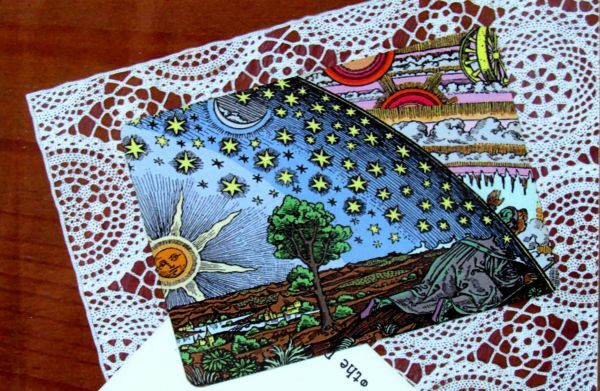 You suddenly realise, that this deck of cards is much more, than a game. It’s a planet full of ideas. 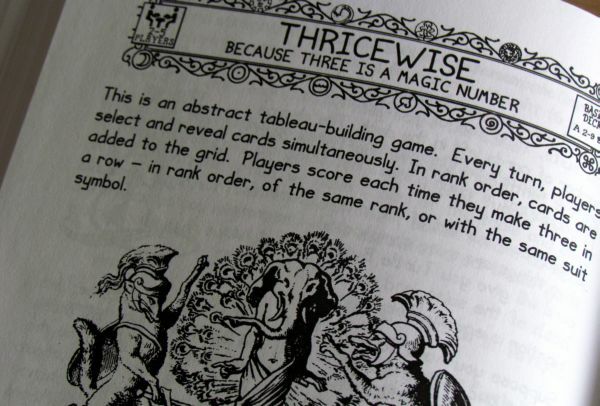 A lot of them are based on a trick-taking game system, that the authors of the games adapted as your imagination. But there is much more waiting for you. 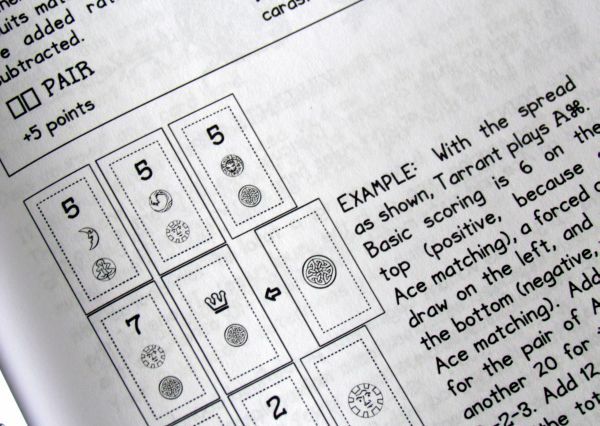 For example, in a game of Frogger, a simplified vision of Cartagena (review available only in Czech) you will be racing on the track from start to finish and move your pieces by playing cards from your hand. Or do you like classic Solitaire game on the computer? With Decktet you can play its variant called Myrmex oranother version, for which you do not need two Decktet decks – Ivory Tower. Opportunities to play are countless and we will look at some of them specifically in another article. This is called a presentation, so it should also be only that. This article is actually closer to the introduction of the whole deck and its concept, than a concrete review of Decktet deck. Implementation of such a review is not really possible, without getting involved in the continuous explaining of the rules. 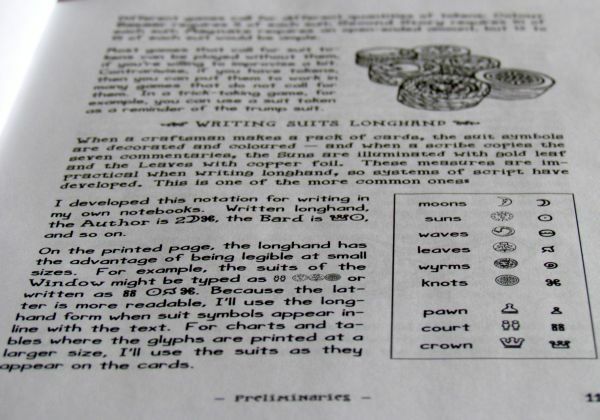 The book is logically assembled and guides novices step by step to learn the basic rules, around which Decktet revolves. 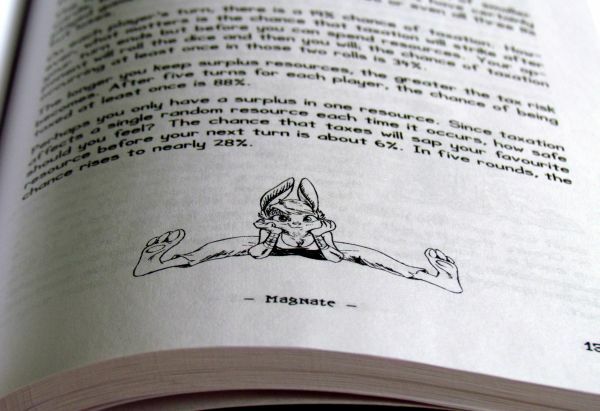 Just then, and in the selection of the best games, the book is absolutely great. 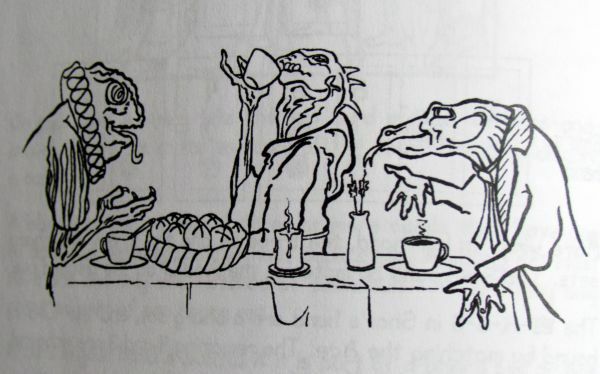 Book is an important source of endless Decktet fantasy. 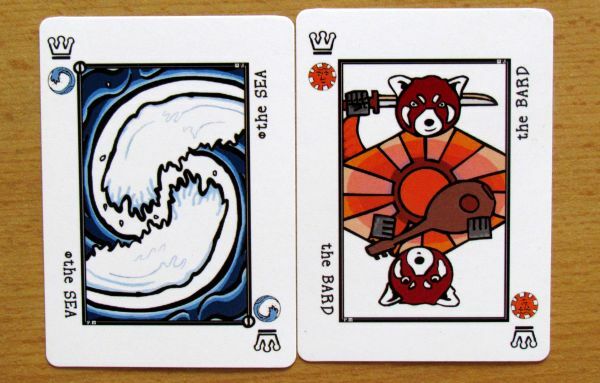 A huge number of games, which can be used with these cards, are a promise of something big. Similarly like pyramids Treehouse, which have gained wide fan base, also Decktet has great potential hidden in human creativity. It just depends on the imagination of players, what they create with these cards. Decktet is not sold in any shop. 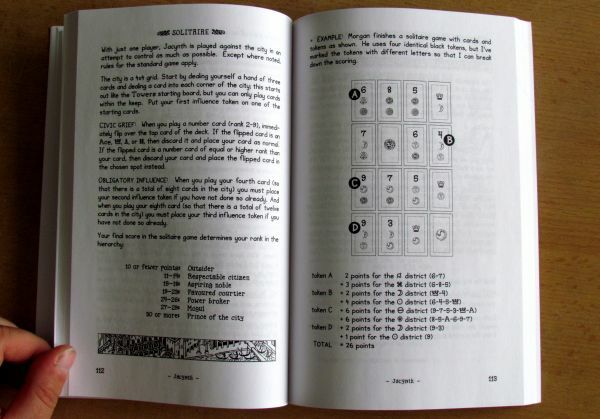 You can order it directly from its author for ten dollars plus shipping in a professionally printed version from the official website http://www.decktet.com/getit.php. 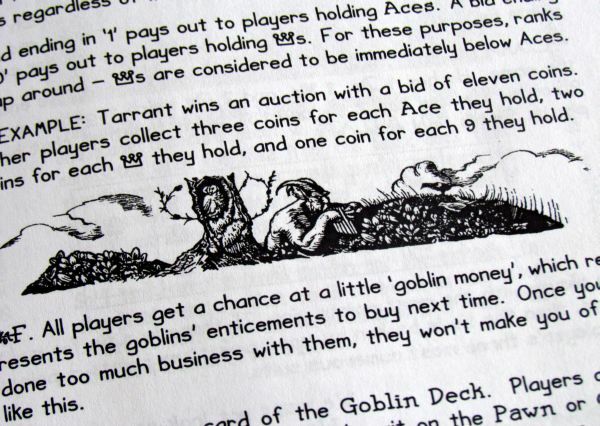 Decktets have several graphic options, that have no effect on the actual gameplay, only on aesthetic perception of players. You can also order special decktet tokens for $ 17, but this is probably option only for advanced players. 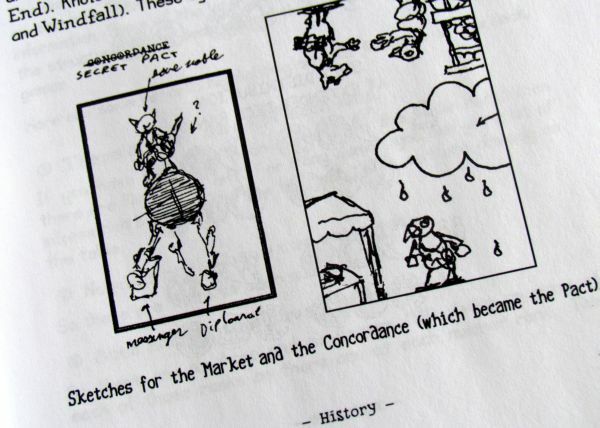 In addition to buying, however, you have yet another great alternative – you can download Decktet as a PDF! 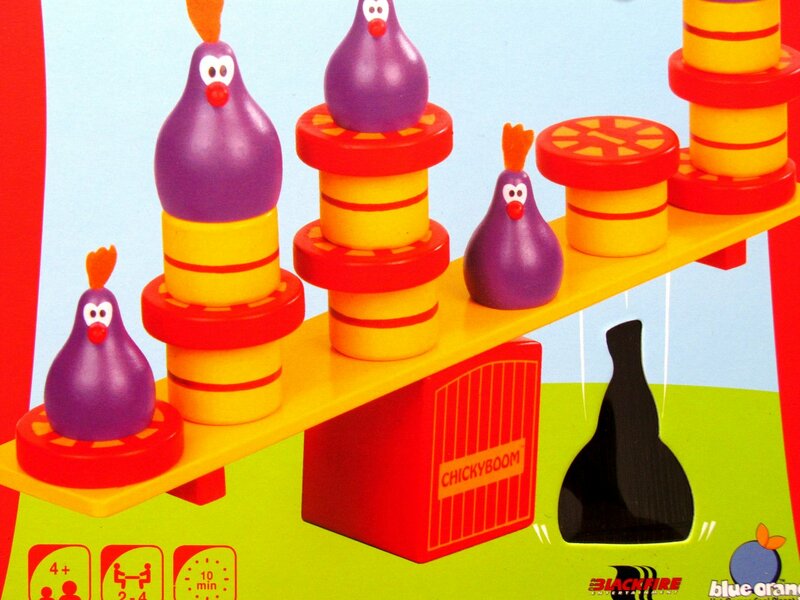 In this version is the whole game absolutely FREE, plus rules of games can also be found on the official website. So basically, if you do not want to own a book, which costs fifteen dollars or eight in electronic form, you can have Decktet without any money leaving your pocket. Decktet is interesting for all parties, players and fans of card games and opens door to the unknown world of fantasy for them. 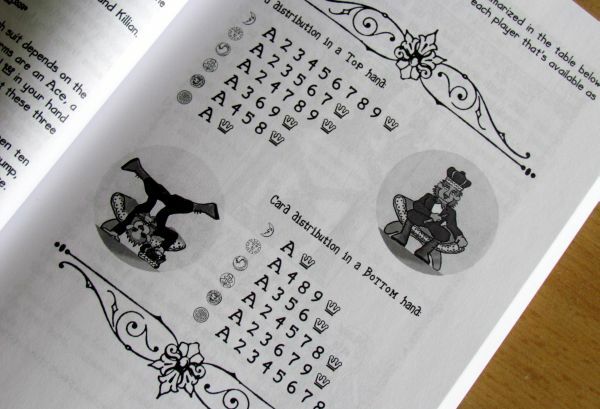 Its elegant system of colorful cards ensures, that none of the games will play as existing originals. Authors have made sure about that. With the book and a little courage, discovery awaits you for weeks and months to come. Decktet is simply an infinite reservoir of entertainment.